column By Ambessaw Assegued (Assegued@anfilo.com). The city is planning to undertake a revitalisation project along Bantyeqetu River, stretching from Urma Garage to Afincho Ber. By the looks of things shown in the design, it seems like an expensive project for the city that fails to build upon the natural heritage of the city, writes AMBESSAW ASSEGUED (assegued@anfilo.com). The names of the rivers around Addis Abeba are as ancients as they sound - Bantyaqetu, Bulbula, Soramba, Qebena, Finche, and Aqaqirivers. Endowed with dozens of streams, creeks, wetlands and rivers, the city can boast to be moored at the heart of the Water Tower of Africa, as Ethiopia is sometimes referred to. The city's rivers are all connected as tributaries to the great Awash River that drains into the Afar Desert. Many of the water bodies around the city are unmarked on city plans or surveyors' maps. This is a significant neglect by city planners, and it should be corrected as soon as possible. Menelik II and his consort, the Empress Taytu, were attracted to the hot springs of Finfine, when they settled and formed their capital here. Legend has it that Menelik II quickly realises that he does not have the means to build bridges and roads for his newly founded capital, a city adorned with many rivers and wetlands. Menelik establishes his seat of government on a small terraced hill between the rivers of Bantyeqetuand Qebena, and a little ways up from the hot springs of Finfine, where his palace still sits. When European diplomats come calling to his court asking for land to build their embassies, he takes them across the rivers and assigns them large forested grants that still grace the capital. The Emperor frequently invites the diplomats to palace activities, and the protocol at that time required prominent foreigners to attend Chelot, the official business hour of the empire, and partake in the mid-day meals that follow. The Europeans will soon realise the exertions and troubles that they face in trying to cross the rivers to get to Menelik's court. Eventually, the French, the English, the Italians and the Russians will finance and build bridges and improve the roads launching the foundation and the basic layout of Addis Abeba. Today, the city administration wants to rethink its rivers. The long-worded Addis Abeba Rivers & Riversides Development Project Office announces recently that it is planning a revitalisation project to implement "parks, landscaping, bridges, ponds, walkways, [flood protection], cleaning and planting indigenous trees." A Chinese conglomerate offered the lowest price to undertake the construction. The city claims that they have already cleared the area and that they are ready to go. There is no mention of creating a riparian habitat or restoring the river ecosystems. The city does not seem to have plans to reclaim the once biologically rich BantyaqetuRiver. From its descriptions, the project appears to be just another effort by the city to pile concrete and roadways and install some plants around the area for good measure. To be sure, there are no natural ponds along the river, and the need to construct human-made ponds on a narrow riverbank in the middle of the city appears wasteful, if not ostentatious. The aim of the expensive project appears to be an effort to create recreational assets for the city, not something that restores the river in a true "riparian" restoration project scheme. Bantiyaqeturiver supports narrow riverbeds and deep gorges as it flows from AfenchoBerthrough Piazza and until it reaches the Sheraton Addis area in Finfinehot-springs, where it widens into a low-lying wetland habitat. That area calls for preservation, restoration and protection, not to be covered by concrete ponds, paver walkways and impermeable surfaces. What remains of the existing narrow strip of natural riparian vegetation along the left and right banks of the river should be preserved, with exotic species of Eucalyptus trees and other plants removed from the area. The plan to introduce "indigenous" plants should also be examined carefully since the most appropriate trees and shrubs to be introduced into the riverine habitat zone should only be riparian plants. In the floodplain areas adjacent to the banks, upland plant species with a natural association to the riparian zone should be the choice, not "landscape" plants as is proposed. There is no mention of bank stabilisation work on the banks of the Bantyaqetu River along the section proposed for the revitalisation project. These river banks are severely degraded and eroded and they are in need of a true riparian restoration and bank stabilisation efforts. "Riparian vegetation used to be an important source of fodder for livestock during the dry season, and is a source of food for humans, medicinal plants, fuelwood, and wood for utensils and homebuilding, also are home to many bird species and other wild animals," writes N.P. Kemper in Riparian Vegetation Index, referring to this habitat types found in Shoa. 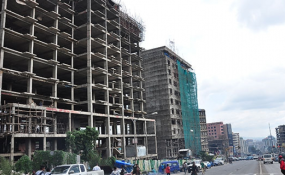 The proposed project could have been an opportunity for the city administration to demonstrate that it cares and understands the degraded ecosystem and declining natural resources of Addis Abeba caused by mismanagement and the rapid urban expansions. A good example to follow for the city would be the renewal of the River Thames in London where the river has bounced back after being declared "biologically dead." Today, after a successful restoration work, much of the riparian ecosystem has returned to life, and the urban community can enjoy the benefits of a positive outcome. With that familiar flair for spending money rather than making allowances for the quality of outcomes, the city has embarked on an expensive project with an uncertain outcome. The river revitalisation project, even if taken at face value, can come up across significant setbacks if the city accepts it without a thorough assessment of the quality of the built product. That the project will be followed by poor maintenance, or no maintenance at all, by the city for many years to come is most likely assured, if past experiences are anything to go by. Eventually, the project will lead to quick deterioration, joining all the other half-finished and unmaintained roads, walkways, drainage systems and parks scattered around the city.